Wakanda bowlers (from left) Muhd Uzair Irsyad, Nur Aina Kamalia, Abang Afiq Yazid and Christopher Tiong receive their prize from a MAW representative. KUCHING: Wakanda, comprising Sarawak Sukma 2016 bowlers, emerged as the champion of the Megalanes Adventure World (MAW) Chap Goh Meh Foursome Special at MAW, King’s centre on Sunday. 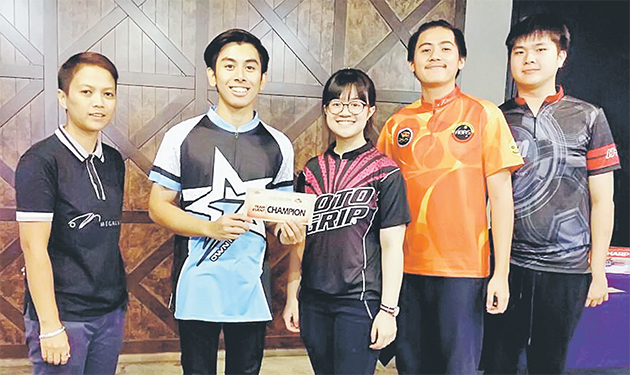 The quartet of Nur Aina Kamalia, Muhd Uzair Irsyad, Abang Afiq Yazid and Christopher Tiong knocked down a total of 3,442 pins over four games. In second place was Elite (Lucas Lim, Adrian Koh, Lim Cho Kwang and Willie Chung) who accumulated a total of 3,224 pins. VC United, with their line-up of Dayang Salina, Zainal Abidin, Robert Lu and Abdul Muhaimin Fitri, had to settle for third place with their total of 2,187 pins while DDYS Team (Edward Juit, Raphael Edward, Galliano Edward and Allexiss O’Neil) finished in fourth place just three pins shy of VC United. Meanwhile, Nurafidza Mohd Amran of Lucky grabbed the Best Ladies award and the Overall High Series Award while Adrian Koh of Elite was the winner of the Overall High Game Award. A total of 17 teams took part in this competition which marked the end of the Chinese New Year celebrations.